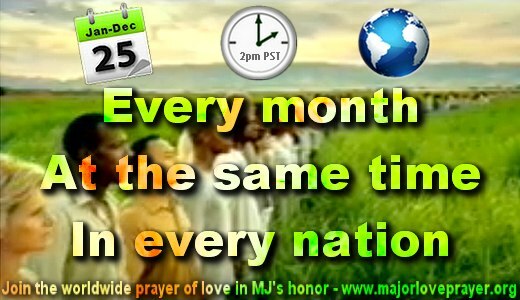 Reminder: Wednesday is January 25, 2012! Reminder! We're sending out a ♥ MAJOR LOVE ♥ on Wednesday, January 25th at 2pm PST / 5pm EST / 22:00 GMT / 23:00 CET (time chart)! Please remind your friends, forums, etc. We can truly make a difference when our hearts unite and form a grid of LOVE ENERGY across the planet. We're raising the vibration, lifting consciousness, bringing light and love into the world, affecting the deepest within to create change. Remember also that the next day (JAN 26 11am pacific time USA) Michael's 3 children will be in Hollywood to make the gloveprint and footprints of his shoes in front of Grauman's Chinese Theatre. This is a big deal. Historic. May we cover Prince, Paris and Blanket with a love that gives them pride and confidence at this major media event. On June 25, 2009, I was reborn. Michael’s death stopped the world and my heart. Every day since, I have been taking baby steps, learning how to live again. I’m still not where I need to be, but I’m getting there. Remembering Michael Jackson and celebrating him with love. He will always be the light of the world that guides me.